Where on earth are those patent leather pumps that I bought a couple of weeks ago to wear with my little black dress? Or the ultra-comfortable ones that let me go shopping for hours on end? How many pairs of leather shoes do I actually have? Which shoes have the highest heels? Are my hiking boots still at the shoe repair shop? You can 'file' your shoes and save properties – such as photos that you took with the built-in camera, for example, the shoebox number, the storage place, and many others. While at the office or relaxing on the sofa, you can conveniently select the shoes that you'd like to wear to an upcoming event or with a dress that you have in mind – or you can show off your shoe collection to everyone. Will I be taller than my partner if I wear these heels? The app will tell me. Looking for the red high heels or the dark blue flats? No problem. The free text search can help you find them. 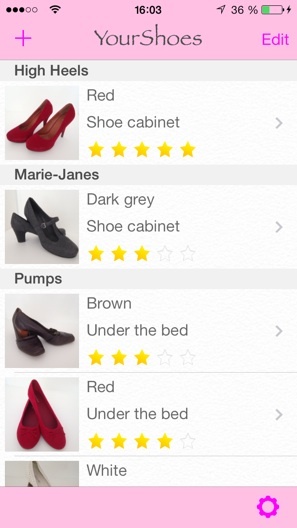 You can rate your shoes according to favorites, how smart they are, or how comfortable. It's very simple and easy to enter your information – no need for a lot of typing. Properties that you enter are saved and, like the app templates, you can select them quickly via a picker view each time.